The UAE has been a member of WTO since April 10, 1996. 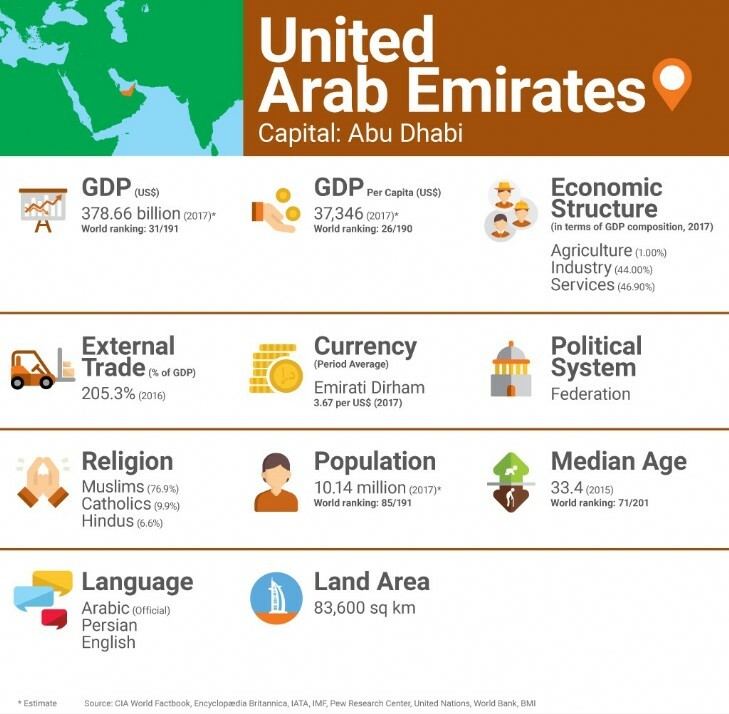 The UAE is a member of the GCC alongside Kuwait, Oman, Saudi Arabia and Qatar. Many goods from the region enter tariff-free. Generally, a customs duty of 5% is imposed on the cost, insurance and freight (CIF) value of imports. A 5% value-added tax (VAT) was introduced in the UAE as of January 1, 2018. The tax will apply to almost all goods and services except basic food items, education and healthcare. The 0% VAT rate also applies to goods and services exported outside the VAT-implementing GCC member states, international transportation, crude oil/natural gas, the first sale of residential buildings, and some specific areas. On October 1, 2017, the UAE implemented an excise tax on tobacco products, carbonated drinks and energy drinks. The tax applies to both locally manufactured and imported goods. The applicable tax rates are 50% for carbonated drinks and 100% for tobacco products and energy drinks. Prohibited products include live swine and other products prohibited on security, health and safety grounds. Restricted products include pig meat products and alcoholic beverages, which require import licences and, in most cases, the tariff on these products is 200%. Trading (importing and/or exporting) in the UAE requires a trading licence and a trader code, which is available from the customs department of each emirate and is valid throughout the UAE. Import and export licences are dependent on ownership rules, with certain industries requiring a domestic partner with a share of 51% of ownership in the importer or exporter in order to obtain the relevant permits. These ownership rules have been changed in 2018 and is further outlined below (see FDI Policy section). Imports of all live animals, animal products (except food products of animal origin) and fodder need an import permit issued by the Ministry of Climate Change and Environment. Additionally, all live animals, animal products, plants and plant products are subject to quarantine requirements and need to be accompanied by health certificates.